I attended a PADI Member Forum here in the Galapagos a couple days ago. 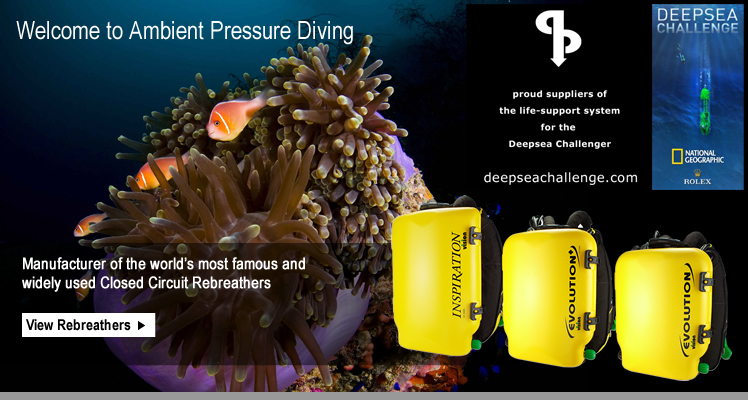 As we all know, rebreathers are a hot and trendy subject worldwide. When RF3.0 came to subject I was invited to make a short summary of the forum. Looking back at it I remembered the RoSPA CCR Aware video created to reach the international diving community. RoSPA is a registered charity and has been at the heart of accident prevention in the UK and around the world for almost 100 years. The RoSPA CCR Aware film gives divers and those new to rebreathers a solid awareness of the key safety factors for diving with rebreathers. I hope this video helps more people make informed choices about diving rebreathers. Please feel free to share it from their YouTube Channel. Is there a quick “checklist for dummies” of some sort that could be used in case of a rebreather accident in case it happens in a remote and un-prepared location like the one I’m in? Answer was no, there isn’t. On the other hand, Martin Parker — the managing director of Ambient Pressure Diving, posted a worksheet in August. Hopefully DAN will also come out with something in the upcoming months. For now, the APD worksheet (which is very unit specific) is available from AP’s website. 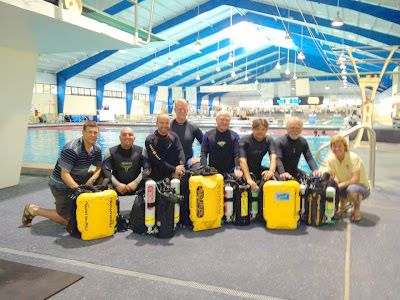 The Rebreather Forum 3: Consensus, Findings and Recommendations can be found here. If you are a rebreather diver I wish you had the most boring time of your life reading this. 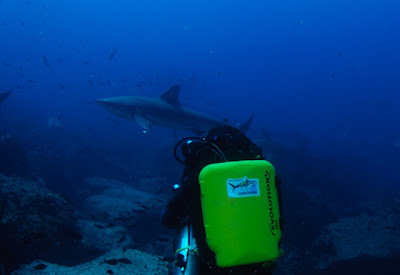 That tells us you know all there is to know for safe rebreather diving in the Galapagos Islands. That also means you probably need to stop reading this blog and commit to a rebreather trip here. We have one in 2013. If you are not a rebreather diver I hope the basic ideas expressed here make sense. If you ever become a rebreather diver please remember them; they could save your life more than once. 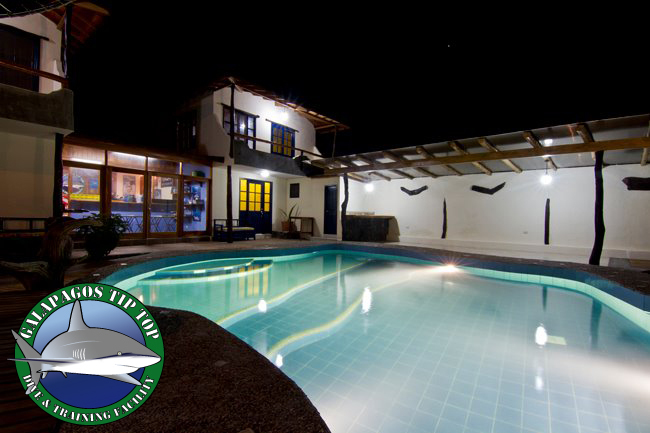 If you are in the region maybe learning in the Galapagos is a good option. We have rebreather courses available. I hope this series of posts help future divers make the right choices about what to do and what to avoid. In the meantime, dive safe. You have to have a checklist of your unit available at the place where you assembly your rebreather. At some point before EVERY dive, pre-breathe the unit and participate in a panga ABC cross check before entering the water. Once in the water you need to participate in a bubble check and team member count. When the current hits a wall or bottom feature, an ascending or descending current is usually formed. This is particularly true in some of the dive sites at Wolf Island. In open circuit you usually compensate for these automatically. Open circuit diving gives you the ability to breathe in or out harder to compensate and this provides time to adjust. This is just not true with Closed Circuit and vertical currents are an issue. Whatever unit you are bringing to the Islands will need some sort of EAN mix if not pure oxygen. As a rebreather diver you know you must analyze your gas before using it. Please go one step forward, log your gas. In Galapagos Rebreathers we thrive to provide with the best of everything and medical oxygen is one of our biggest challenges. Appropriately filled and drained certified medical grade oxygen can only be obtained in Ecuador Mainland. We do analyze and measure the pressure of all gases prior to delivering them to our customers. This is just our own check and quality management practice. In any case, you are responsible for analyzing and testing your own gases prior to any dive. Make your competency as a rebreather diver and your good practices visible by completing the adequate paperwork by filling in the Nitrox Log on the boat and labeling your cylinder contents. We do have several oxygen clean booster pumps available for rent in what I call a “self-catering” mode. It’s very simple, you rent Oxygen and a Booster from us and run your own fills. Please note that a Gas Blender Certification or equivalent is required in order to access the self-catering mode. We can also provide the training if needed. The Galapagos Islands are an Oceanic archipelago 600 miles / 1000 kilometers away from the nearest piece of continental land. In addition, the archipelago is subject to 7 ocean currents that change in intensity throughout the year. These currents combine with the chaotic whimsical sea bottom creating all sorts of currents and countercurrents than can often defy logic. Dives are made drifting with current and drifts going in the opposite direction as originally planned is something that does happen. The main source of surface supervision comes from tender operators who follow bubbles; hence the rebreather paradox. When diving on a rebreather in the Galapagos Islands you have to be ready to change the plan and maybe even abort the dive if the current takes you the wrong way. Sometimes an aborted dive can just be the best possible outcome, don’t lose your chance for the best available. Since there are no bubbles to follow you need a surface marker as soon as you start ascent. A Diver Surface Marker Buoy is something we deploy on every dive here. You will need a readily accessible, easy to use DSMB attached to a reel or spool and a backup. I highly recommend the longer ones since surface conditions can be choppy and 3 – 5 foot / 1 – 1.5 meters are very common. Once in the surface a pneumatic audible device comes in very handy, make sure you have one. In addition, having some sort of communication device to call for assistance is reasuring. I think the Nautilus Lifeline is a good option, we are dealers for them. Really? Do we have to stress that one?. It might be a rebreather bunny that lives in travel cases and suitcases or that Mr. Murphy is a TSA agent, I’m not quite sure yet. I do know that one of them loves to ruin sensors, hand tight connections, o-rings, corrugated hoses and all sorts of yummy stuff. The extended range of rebreather consumables and replacement parts makes it impossible for us to provide with a full inventory. Special requests made with anticipation can be arranged but as a general thumbs rule you will need to bring your own consumables, spares and special tools. How many times have you heard that your extensive open circuit experience does not make a big difference and could even be a handicap for you when rebreather diving? Probably many and this is not an exception. Diving a rebreather in the Galapagos Islands is not something I would recommend to a novice rebreather diver. Stressing surface conditions, quick negative descents, strong horizontal currents, camera task loading, vertical currents, a very remote oceanic location and why not peer pressure for performing can be something that could, at least, take a lot of the enjoyment you probably seek out of your experience. If you are a novice rebreather diver thinking of coming to the Galapagos think twice. You can probably gain valuable rebreather diving experience in less stressing and cheaper locations near home before you come here with a rebreather. If you are an experienced rebreather diver that has been off the loop for a while, also think twice. Our rebreather diving liability release form tries to bring your experience forward in a rather interactive document you will need to really read while you fill up. This is our way of saying your experience really counts. Please don’t come here un-experienced. In order to obtain service from us, every rebreather diver needs to provide a medical examination signed by a physician within a year prior to the end date of the trip. This is our way of making sure you are fit (both mentally and physically) to dive a high tech life support system in complex environmental conditions. 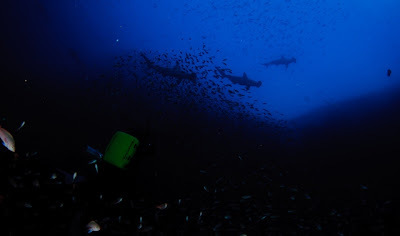 You probably know the action in the Galapagos dive sites is usually deeper than 60 feet / 18 meters. As a rebreather diver you should know that below this depth an off-board bailout cylinder is required by almost every existing training agency. As you might know, we tend to have strong currents here and a sling cylinder often increases drag. This makes maneuvering the already heavier and bulkier rig (in comparison to a single back mounted cylinder) significantly more challenging underwater. Picture this: As current tries to rip the loop out of your mouth you experience the barnacles you hold to remain in place start breaking. With one hand holding your expensive camera, you only have another one to prevent your loop from exiting your mouth (and therefore inevitably flooding the unit) and to crawl forward to a place where you can hide from it. 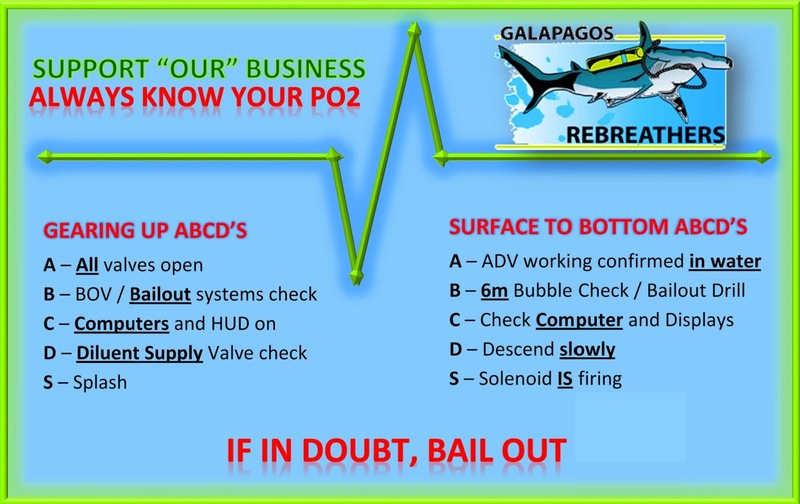 The availability of bailout gas is a critical factor in such a situation; your bailout plan should not only include making it to the surface slow enough not to compromise your safety and therefore the overall trip, but also heavy breathing during that ascent. A minimum of 40cft / 5.7 liters of gas are required for a diver with an average SAC to perform such task. In Galapagos Rebreathers we have 40 cft / 5.7 liter cylinders with DIN / YOKE convertible valves available for rent. This size of cylinder minimizes the drag when appropriately side-mounted on your rig. If renting a bailout cylinder is too expensive for you, maybe you should reconsider diving on a rebreather. 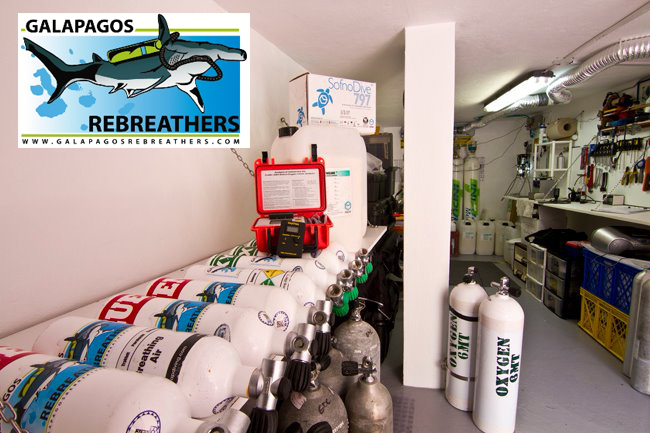 Or you can use a standard 80 cft / 12 liter cylinder readily available from your dive operator. 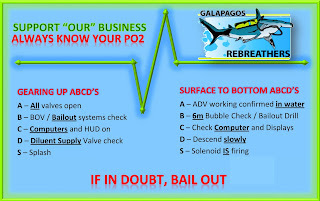 In any case, whatever you do please have off-board bailout gas available with you in every dive. That’s an easy one I’m sure. On the other hand, being the only CCR diver in a trip of Open Circuit divers IS diving solo. 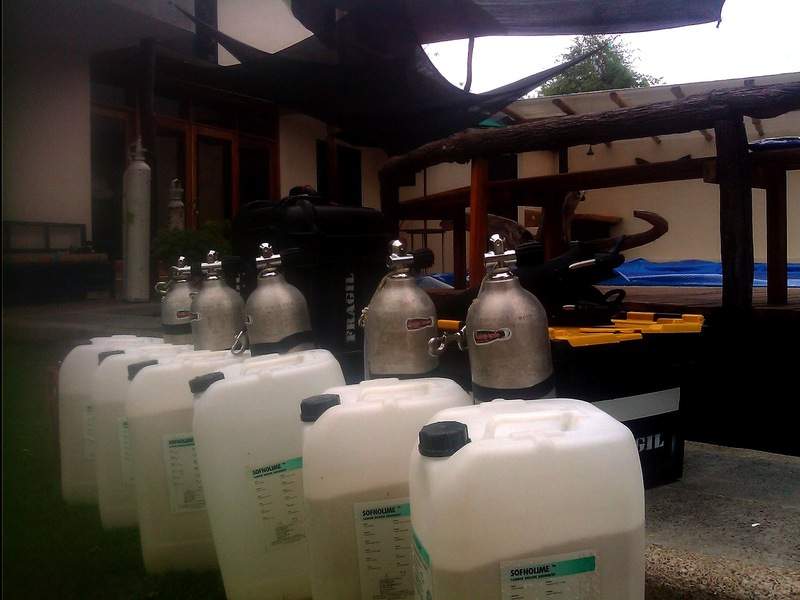 Generally on every dive but particularly as a trip progresses, nitrogen starts to build up. In that scenario you will find your “buddies” can’t make the same dive profiles as you do and are in completely different gas loading schedules. People can argue as long as you maintain a profile that respects the OC “handicaps” you can still respond to an emergency and that’s true. On the other hand, what if YOU need help? A second important reason is knowledge. It is very unlikely to have an Open Circuit Diver who is knowledgeable enough on rebreather diving to perform (and cross-check with you) pre dive safety procedures and in water checks. In the event of a rebreather related rescue scenario having a closed circuit trained buddy does make a big difference. One of the reasons why Galapagos Rebreathers exists is to provide appropriate rebreather travel opportunities to the Galapagos. Being in a group of CCR divers here provides several benefits; of course one of them is the inherent rebreather safety that comes from a closed circuit oriented operation. Sharing the trip with other CCR divers will allow appropriate rebreather profiles, maximizing enjoyment. A huge factor for diving rebreathers here is that sharks, particularly hammer-heads, seem to get closer and allow longer, more natural interactions when they encounter silent divers. Truth is you can’t have this if there are another 15 open circuit divers in the water at the same time. It’s just too noisy. "These posts originate from lessons learned during the development of rebreather travel in the Galapagos, and through studying other's experiences. " 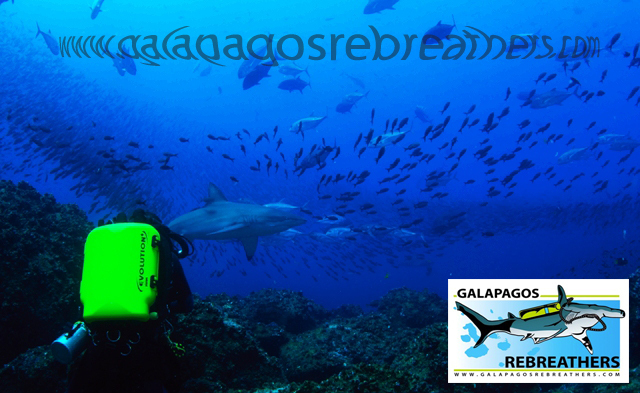 Galapagos Rebreathers is a firm that has pioneered in developing rebreather diving in the Galapagos since 2010. Over almost two years, we have successfully supported over 5 different rebreather friendly live-aboard trips and one major film project with a total of 10 rebreather divers who have performed over 300 hours of completely safe, professionally supported and rebreather supervised diving. 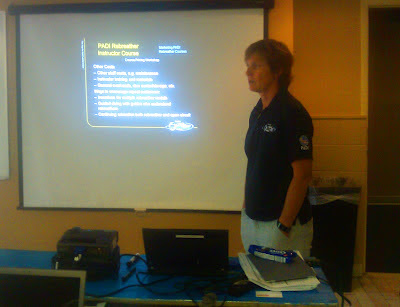 We work in affiliation with the most renowned rebreather diving professionals and instructor trainers in their regions. Before we started this, rebreather travel to this world class destination was nearly impossible. There was also no repository for the lessons learned about the particular conditions that could make diving in such a special destination safer. I’m glad to say this is no longer true. At this time, Galapagos Rebreathers is the only firm actively offering rebreather support for people who want rebreather travel opportunities to the Galapagos Islands and I am the only active CCR professional in the region. Sharing knowledge about the lessons learned and particularities of diving rebreathers in Galapagos might be counterproductive from a commercial standpoint but is cumbersome in the face of preventing accidents. For those who know me, you probably know I am someone with a positive and corrective approach. With this in mind, I have developed a series of posts to be published in this blog during the next few days. These posts come from lessons learned either by me and my companions while developing rebreather travel in the destination or from the study of what others have experienced here. You are welcome to follow this series of posts by using this tag. First post will be posted tomorrow. Stay tuned. I’m back from a 21 day rebreather filming expedition to remote areas of the Galapagos with multiple award winning underwater cameraman Michael Pitts, underwater camera assistant John Chambers and HSE dive supervisor Dan Stevenson. During the 17 days of diving in the central, far north and western areas of the archipelago we performed a total of 32 hours of rebreather diving using two Classic Inspiration CCR’s (Michael and John), one Inspiration Vision (Dan) and one Evolution Plus (Jorge). Dive profiles ranged between 12 and 35 meters with an average dive time was 90 minutes per dive having no issues with the rebreathers. All dives were performed from Expedition Vessel Queen Mabel and guided according to the Galapagos National Park filming permit. Galapagos Rebreathers provided Granular CO2 absorbent, medical grade oxygen, bailout cylinders while I provided expertise and technical support as a rebreather technician on board. The recordings from this filming expedition will be used by Colosus Productions in a documentary about the Galapagos Islands. The three-part natural history series which tells the story of the remote Galapagos islands is scheduled to air on Sky 3D in late 2012; it has been written and presented by Sir David Attenborough. This is the first film produced by Colossus Productions, a collaboration between SKY 3D and Atlantic Productions, set up to develop original 3D programming for both UK and international audiences. Moreover, the use and promotion of rebreather technologies needs to go hand in hand with the development of the new scuba instructors. Only by doing this we will be able to increase the safety margins and minimize the human factors associated with rebreather use and abuse. This is an honor and a big responsibility for me. I'm looking forward to the future. 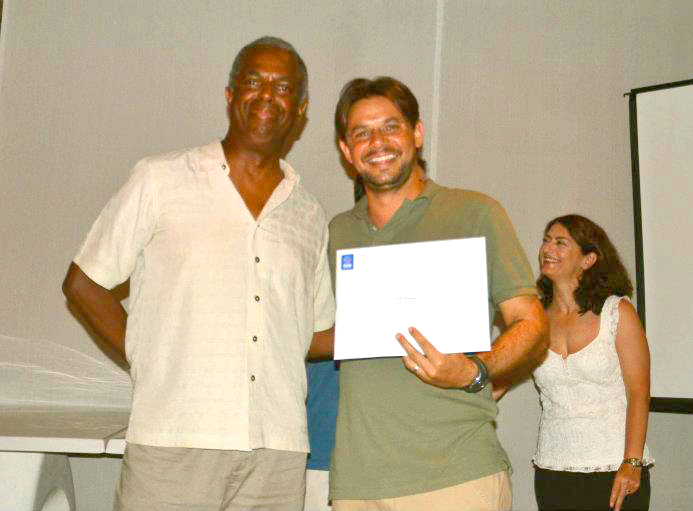 I am back from the Dominican Republic after attending the 2012 PADI Course Director Training Course. The CDTC is definitely the most exclusive PADI program to date and is open for a select group of applicants; a few months ago I was encouraged from people at PADI and other instructors in the region to submit my application. I was accepted and attended the course from June 19 to 28. The 10 day program provides an in depth perspective of the PADI system for Diver Education, the Instructor Development Process, actual trends in the business of Instructor Training in different markets and other important aspects of being at the top of the Scuba Education sector worldwide. It is also a lot of fun. I would like to thank the people who encouraged and then supported me in taking this step in my career as a dive professional. You know who you are! I would also like to thank my team “The Killer Papayas” for all the fun and rewarding moments we had during the CDTC. Papayas: I know you know the CDTC would have not been as fun and easy as it was without each other. Now the real challenge starts. The task to role model and develop a complex market with many stake holders and challenges lays ahead. It is my objective to lead with example, be positive and work with ALL the diving professionals in the region to push OUR business forward. 1. The Forum recommends that rebreather manufacturers produce carefully designed checklists, which may be written and/or electronic, for use in the pre-dive preparation (unit assembly and immediate pre-dive) and post-dive management of their rebreathers. The current version of these checklists annotated with the most recent revision date should be published on the manufacturer’s website. 2. The Forum recommends that training agencies and their instructors embrace the crucial leadership role in fostering a safety culture in which the use of checklists by rebreather divers becomes second nature. 1. The Forum applauds and endorses the release of pooled data describing numbers of rebreather certifications by training agencies and encourages other agencies to join ANDI, IANTD, and TDI in this initiative. 2. The Forum endorses the concept of making minimum rebreather training standards available in the public arena. 3. The Forum endorses the concept of a currency requirement for rebreather instructors. We recommend that training agencies give consideration to currency standards with respect to diving activity, class numbers, and unit specificity for their instructors. 4. The Forum recognizes and endorses the industry and training agency initiative to characterize “recreational” and “technical” streams of sport rebreather diver training. These groups will have different operational, training and equipment needs. 1. The Forum recommends that training agencies provide rebreather divers with a simple listof instructions that will mitigate common errors in evidence preservation after a serious incident or rebreather fatality. These instructions will be developed under the auspices of the Undersea and Hyperbaric Medical Society Diving Committee in consultation with the relevant RF3.0 presenters. 2. The Forum endorses the concept of a widely notified centralized “on-call” consultation service to help investigators in avoiding errors or omissions in the early stages of a rebreather accident investigation and to facilitate referral to expert investigative services. 3. The Forum recommends that in investigating a rebreather fatality the principal accident investigator invite the manufacturer of the incident rebreather (or other relevant equipment) to assist with its evaluation (including the crucial task of data download) as early as is practicable. 4. The Forum endorses the DAN worldwide initiative to provide a means of on-line incident reporting with subsequent analysis and publication of incident root causes. 1. The Forum recommends that all rebreathers incorporate data-logging systems, which record functional parameters relevant to the particular unit and dive data, and allow download of these data. 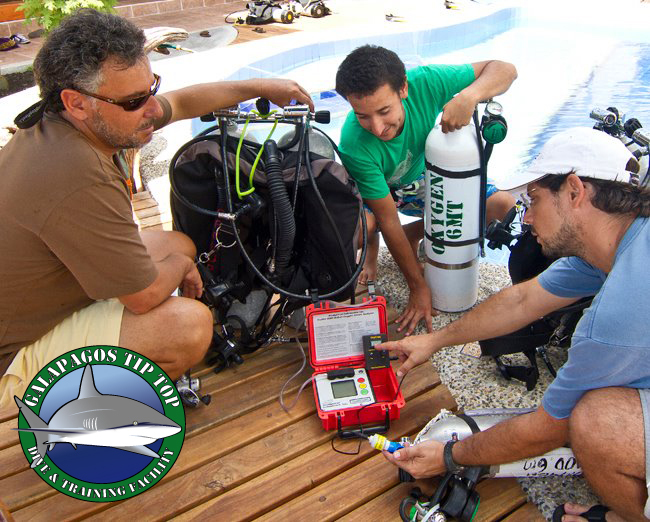 Diagnostic reconstruction of dives with as many relevant parameters as possible is the goal of this initiative. Footnote: An ideal goal would be to incorporate redundancy in data logging systems, and as much as practical, to standardize the data to be collected. 2. The Forum endorses the need for third party pre-market testing to establish that rebreathers are fit for purpose. Results of a uniform suite of practically important unmanned testing parameters such as canister duration, and work of breathing (qualified by clear statements of experimental parameters) should be reported publicly. Ideally, this testing should be to an internationally recognized standard. Training agencies emphasize these parameters in training courses; and, Manufacturers display these parameters in places of prominence in device documentation and on websites. 4. The Forum strongly endorses industry initiatives to improve oxygen-measurement technologies, and advocates consideration of potentially beneficial emerging strategies such as dynamic validation of cell readings and alternatives to galvanic fuel cells. 5. The Forum identifies as a research question the issue of whether a mouthpiece-retaining strap would provide protection of the airway in an unconscious rebreather diver. 6. The Forum identifies as a research question the efficacy of a full-face mask for use with sport rebreathers. Check the slide show of the 2012 Aquanauts Galapagos Live-Aboard trip to the northern islands of Wolf and Darwin on Rebreathers below. You can also view it on the Galapagos Rebreathers Facebook Page. Enjoy!! Just a teaser. More photos and a small written report to follow. The 2013 trip still has some spots open. Click here for details. We have our friend Peter Seupel from Aquanauts Grenada here since yesterday. We will be on a weeklong live-aboard trip starting tonight with 3 other divers. 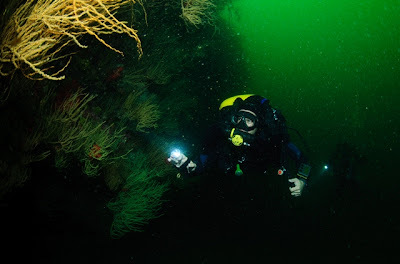 One of our divers if photographer Claus Meyer. If you follow this blog for sure you have seen his photos. 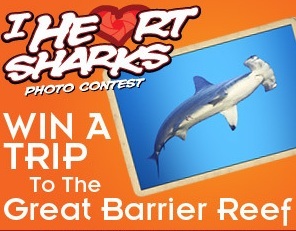 His Galapagos Shark and Rebreather Diver shot won the PADI Contest a few weeks ago. I will report on the trip on this blog upon my return, now I have to get back to loading the stuff. Held at the Caribe Royale in Orlando, Rebreather Forum 3.0 starts today. Jorge A. Mahauad, managing director of Galapagos Tip Top Diving and Galapagos Rebreathers will be attending the conference and promoting rebreather travel to the Galapagos Islands. Jorge can be reached at 239-849-6795 or by email and will be glad to talk about rebreather travel to the Galapagos to anyone who is interested in it. 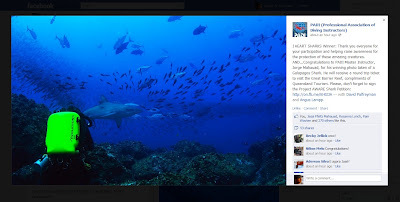 About a month ago I uploaded one of the Galapagos Rebreathers theme photos to a Facebook PADI contest. The contest was titled "I heart the sharks" and the objective was to raise awareness about sharks in social media and support the ongoing Project Aware efforts to shark conservation. You can view the photo here. Well, we won!!! Now, a couple precisions need to be made. At first, Photo was taken by Dr. Claus Meyer, a customer of us. Claus released all rights to use these and many other photos of him to promote Galapagos Rebreathers. Second, the ticket to Australia is obviously going to Claus. Thank you everyone for the votes and support on this. We would have never achieved the win without the votes and support of your social media actions. See you in Rebreather Forum 3. 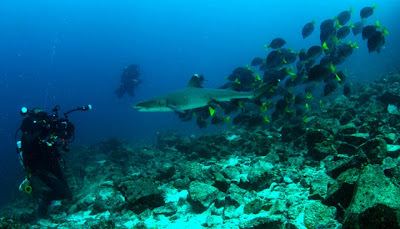 We have rebreather liveaboards with photo opportunities as good as this in 2012 and 2013. There is still availability for the one in 2013. For more information on the 2013 trip please click here. The 2012 trip is fully booked and will come right after Rebreather Forum 3. 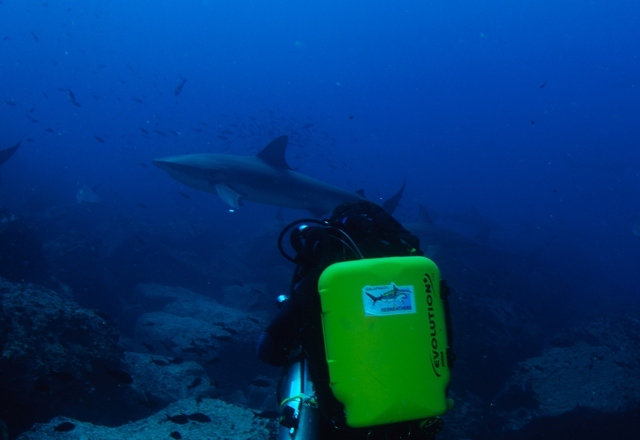 Galapagos Rebreathers is hosted by Tip Top Diving in the Galapagos Islands. At this time, we offer rebreather instruction in the APD rebreathers (Evolution, Evolution + and Vision Inspiration) with air diluent through TDI. 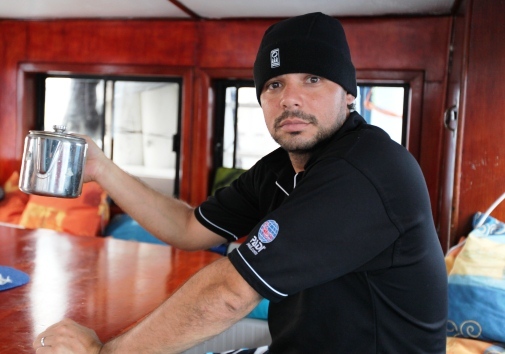 Jorge A. Mahauad, manager of the firm will be x-ing over to PADI Tec 40 Rebreather Instructor during Rebreather Forum. Needless to say, PADI rebreather diver, advanced rebreather diver and Tec 40 CCR diver courses will also be available in the near future. Here are some of the latest photos of our training facility. 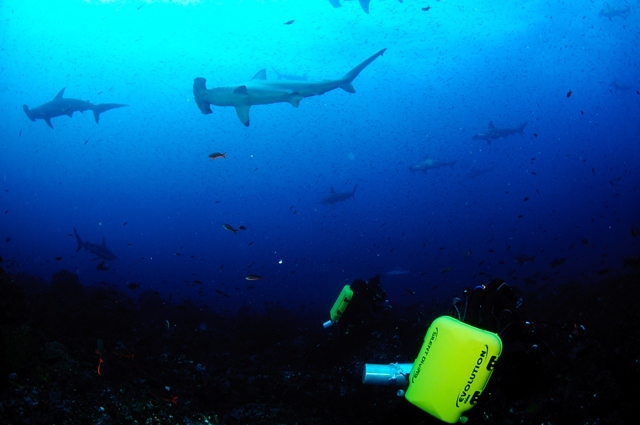 The Galapagos archipelago is a world famous hotspot for observing marine mega fauna, especially sharks. The use of rebreather technologies provides great opportunity for very close wildlife experiences in the islands. In the Galapagos hundreds of hammerhead sharks and giant manta rays cruising overhead while big schools of Galapagos sharks wonder very close can be the fore playing scene for a bus sized whale shark to appear out of the blue. This is the reason why many diving enthusiasts and underwater imaging specialists come every year. But very few of the regular tourists will ever have the opportunity to witness this world patrimony national park with the bubble less and quiet and moist environment a rebreather provides. From September 16 to 23, 2013 a rebreather oriented expedition to the Galapagos Islands is being organized by PADI Course Directors and Technical Instructor Trainers Andy Phillips and Paul Toomer. 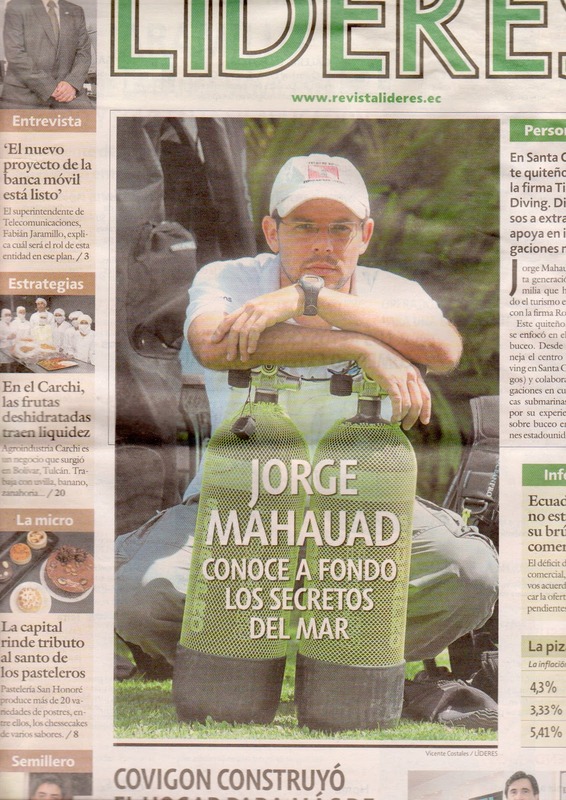 The specialized trip is supported by Jorge A. Mahauad and Galapagos Rebreathers. 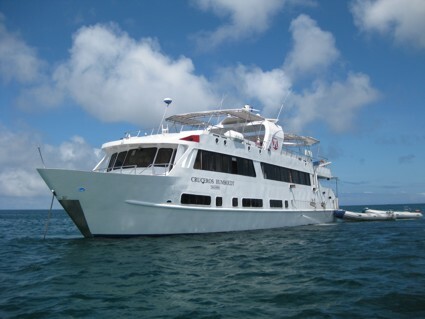 The organizers have chartered Humboldt Explorer, a 35 meter steel hulled licensed live-aboard vessel with capacity to accommodate 16 divers in 8 air-conditioned double occupancy cabins with private bath and showers. A comfortable dive deck and a camera table are available for all divers. Social areas include a partially covered sundeck with Jacuzzi, ample seating space and a salon including a lounge and dining area. This is the first rebreather only trip in the Galapagos organized by Galapagos Rebreathers. Trips like this have rarely been put together in the past and this amazing experience is now made available to a very limited and select group of divers. Galapagos Rebreathers will provide an expedition technician to operate boosters and deliver high pressure oxygen. Granular or pre-packed CO2 absorbent, on board steel 2 or 3 liter rebreather cylinders with in line style valves and 6 liter aluminum bailout cylinders with DIN convertible valves and stage / sidemount rigging will be available for all rebreather divers. Jorge A. Mahauad, founder of Galapagos Rebreathers, was featured as the cover of LIDERES today. The weekly business publication features different entrepreneur profiles and is the leading weekly business publication of Ecuadorian Press. 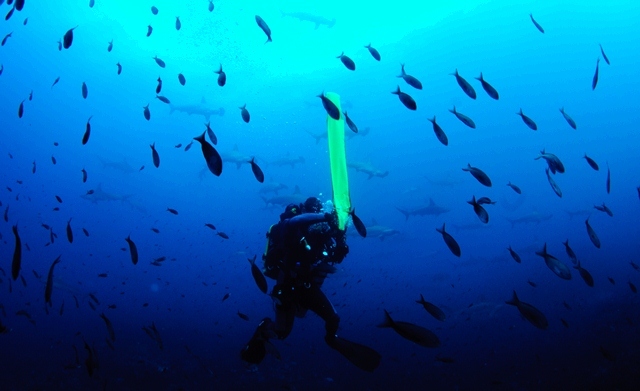 The article highlights his entrepreneurship in developing the technical and rebreather diving market in the Galapagos Islands. The Galapagos Islands are known worldwide for providing incredible opportunity to observe marine mega fauna. Common encounters include big schools of hammer-head and galapagos sharks, white tip reef sharks and whale sharks. As a result, the northernmost islands of Darwin and Wolf have been considered top ten dive sites in the world for big encounters by many diving magazines worldwide and a healthy dive tourism market has grown steadily. Until recently, the use of advanced diving technologies had been limited due to the recreational diving profiles performed and the close encounters available even for open circuit divers. But this is no longer the case. The opportunity to experience the worldwide famous destination on a closed circuit rebreather is now available and provides a whole new level of enjoyment underwater by granting closer encounters and great photo and video opportunities. The following footage is a raw-ish edit of a single 60 minute rebreather dive in a recent trip organized by PADI Master Instructor Jorge A. Mahauad and PADI Course Director Andy Philips. This trip is the second since 2010 by Galapagos Rebreathers, a rebreather travel specialized organization in the Galapagos Islands who is consistently promoting and executing rebreather live-aboard and land based trips there.